Walker School faculty from St. Louis and Charleston area locations. Department leaders in the George Herbert Walker School of Business & Technology met with the faculty at the Charleston Metropolitan and Joint Base campus locations Friday, June 17. 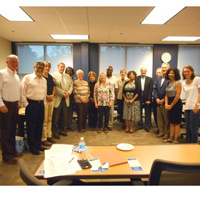 Their visit is part of a series by this leadership team from the St. Louis campus to interact and connect with Walker School faculty at Webster University's extended campuses. Among the goals for the visit by Management Department chair Joe Roberts, Business Department chair Dave Porras and Business professor Debbie Psihountas are to encourage collaboration among the faculty and enhance student learning outcomes. See more clips from this student on how the Webster community is a competitive advantage, and the benefit of real-world experience.